In late December of 1705, Guru Gobind Singh searched for an ideal location to engage the Mughal army in warfare. 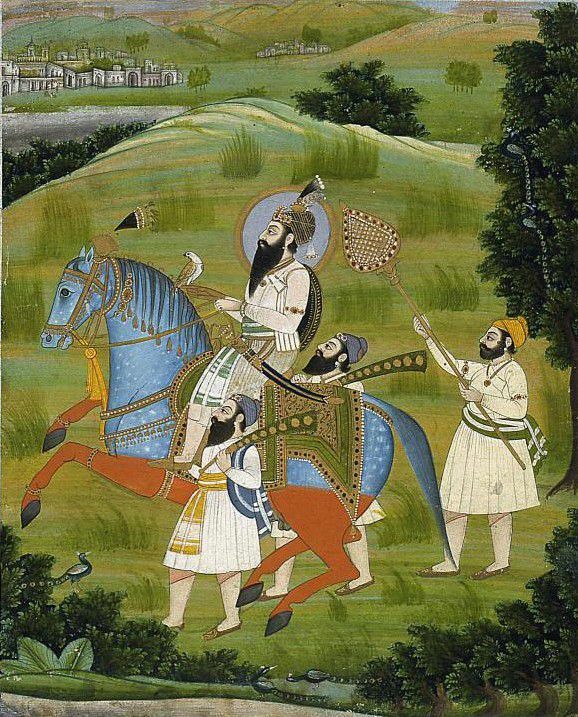 Accompanied by Sikhs who joined up with him along the way, the Guru eventually made his way to Malwa, near Khidrana. A delegation of Sikhs concerned by the likelihood of warfare approached Guru Gobind Singh and offered to intercede on his behalf and negotiate with the Mughals. The Guru refused, reminding them of Mughal Emperor Aurangzeb's broken vows, deceitful ways and treacherous acts. Upon learning of the martyrdom of the gurus eldest sons a Chamkaur and his youngest sons and mother at Sirhind, Bhag Kaur (Mai Bhago), her brother Bhag Singh, and her husband Nidhan Singh, roused a band of 40 remorseful Sikhs from Majha who had returned home during the evacuation of Anandpur after renouncing Guru Gobind Singh in exchange for safe passage and deserting his army. The Majha Sikhs expressed sincere repentance, sought permission to rejoin the Guru and readied themselves for battle. Upon reaching the Khirdana reservoir, Guru Gobind Singh positioned his warriors. To confuse the enemy, the 40 Majha Sikhs spread tents of cloth over shrubs to give the appearance of an encampment and secreted themselves with weapons ready among Van trees and the surrounding Karir bushes. Charging into the trap they believed to be the Guru's camp, Mughal's soldiers led by Wasir Khan suffered a relentless surprise attack. The Guru climbed high up the hill, or Tibbi, behind the cover of trees, where he shot arrows into the oncoming horde overwhelming the enemy. After expending their bullets, the Guru's warriors clashed with the enemy face to face, courageously fighting hand to hand with swords, and lances, both on horseback and on foot. One by one the 40 repentant Majha Sikhs sold their lives at a great cost to their Mughal adversaries. At the day's end, all 40 of the Majha warriors had fallen. Their heroic sacrifice enabled the Guru to hold the valuable reservoir water so that exhausted enemy troupes had no recourse but to turn back or succumb to thirst. The Guru picked his way through the bodies of the defeated enemy looking for Sikh survivors. Of the 40 Majha Sikhs, he found only Bhai Mahan Singh and Mai Bhago living. Bhai Mahan suffered a terrible infliction, Guru Gobind Singh knelt and lifted his beloved warriors' mortally wounded body to his breast and bending close to his ear, thanked Bhai Mahan for his selfless act, and asked if he had a last request. Bhai Mahan replied that he lived and died only for his Guru's service and begged that the papers of renunciation the 40 had signed in Anandpur be destroyed and pleaded that the 40 be reinstated as the Guru's own. The Guru produced the paper and tore it into pieces casting it to wind. The event is thought by historians to have occurred on December 29, 1705, however, commemoration dates may vary by region and is locally observed April 15th. The 40 repentant warriors, known as the Chali Mukte, are mentioned in the prayer of Ardas during each and every Sikh worship service. This prayer is generally attributed to the Sikhs who fought with Mai Bhago but may actually include the 40 Sikhs who remained faithful to Guru Gobind Singh and fought with him at the battle of Chamkaur, where the Guru's elder sons and all but three warriors perished.